This state-of-the-art PIDO tool, written to allow easy coupling to almost any computer-aided-engineering (CAE) tool, is now even more powerful and user-friendly than previous versions. New features have been added to the list of available algorithms in the Scheduler and Optimizers, including: Screening Analysis Genetic Algorithm (SAnGeA), FAST algorithm, HYBRID algorithm, RSM Export, MACK, Taguchi Signal Factor, Reduced Factorial DOE, Uniform Reducer and Simplex. New functions have been added to the Tools and Charts, including: New Parallel chart, Main/Interaction Effects charts, CAP Charts, Chart batch option and RSM chart slider option. New direct integration nodes have been added to the list of modeFRONTIER nodes and enhancements have been added to existing nodes, including features such as: The Grid Tool, Easy Driver node, SpaceClaim node, Curve Fitting node, Ansys Workbench node, AMI node, GT-Suite node, AVL node and JMAG node. Other major improvements are made, including: CST node, License Daemon for Mac OSX platform, Matlab node and algorithm parameters tuning. 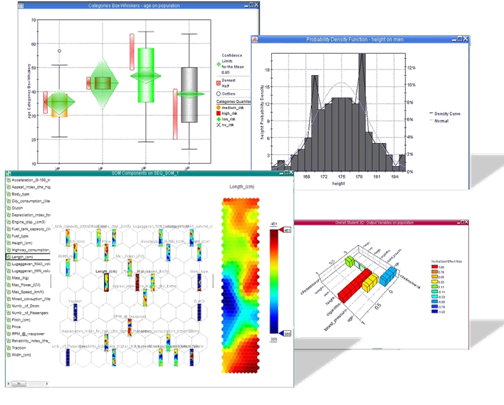 In addition, modeFRONTIER v4.0 contains a wide range of data-mining tools to help understand complex data. 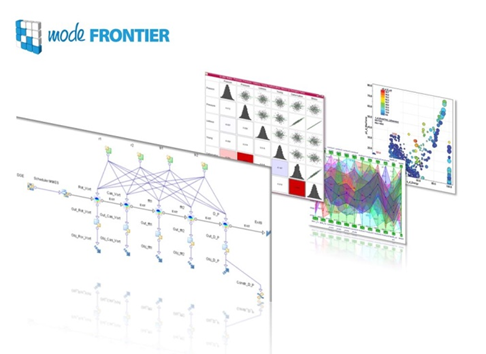 modeFRONTIER features an enhanced set of statistical tools to analyze and exchange data. A Statistic Summary, ANOVA, Significance Analysis, and Distribution Fitting have been added to the extensive list of state-of-the-art tools already in the current version of modeFRONTIER. NEW WIZARD MAKES CREATION OF META-MODELS EASIER! The creation of meta-models (including response surfaces and neural networks) can be a complex and laborious task, especially in situations where high accuracy is required, modeFRONTIER v4.0 features a comprehensive wizard which enables the user to create multiple meta-models quickly and automatically. The meta-models are checked for accuracy, allowing the user to select and screen the optimal model. Analyzing complex data-sets has become easier with the new clustering tools available inmodeFRONTIER v4.0. Clustering tools, based on Hierarchical and K-Means methods, allow the user to identify, within a data-set, groups of points with similar design features. Self Organizing Maps (SOM) have been introduced to allow the user to analyze and organize data sets by highlighting the most important relationships between inputs and outputs. New automatic work-flow creation:modeFRONTIER now features even more seamless integration to third-party CAD/CAE tools. New Calculator Node allows advanced post-processing, using built-in functions, to be performed directly in the workflow. VTC Solution © 2015. All Rights Reserved.